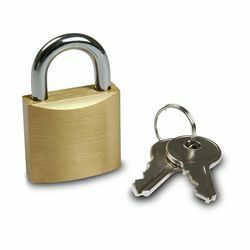 This authentic Master brand keyed lock features a 1 1/8" (29mm) wide brass body that provides resistance to the elements. The 9/16" (14mm) tall, 3/16" (5mm) hardened steel shackle is unlocked with a 4-tumbler key. Includes two keys.